Today I visit an interesting atelier in Kyoto. This atelier specializes in restoring ancient embroidery of canonical robe. This is a lotus flower. Lotus flower is closely related to Paradise,Heaven in Buddhism. This is like real lotus flower...This is made with wonderful skill. But artisans in this atelier do not create this from the very beginning. Their work is to restore this kind of ancient embroidery. so they need to be restored. That is why this repair shop is needed and relied on for many temples in Kyoto. This is also lotus flower. This is peony. In Buddhism,peony is also related to Paradise,Heaven. Restoration of these embroideries is once in 10 or 20 years. These flowers are so gorgeous and so realistic. And these are not for Zen. This is important. Zen motto is "modest,and simple,humble". These embroidery are too gorgeous for Zen temple and Zen priest. These embroideries are for "Higashi-Honganji" and "Nishi-Honganji". This is a Chinese phoenix. This is an imaginary bird. Chinese phoenix is also related to Paradise,Heaven in Buddhism. This bird spread its wings. I can see this bird flapping its wings a couple of times....Wow! I admire this delicate workmanship. Originally,these way of embroidery came from India,and China about 1500 years ago. And artisans in this atelier maintain this tradition. They restore countless embroideries of canonical robes from many temples in Kyoto. And this is Chinese lion. This is technique of embroidery to make this lion as real as possible. so we restored his eyes using glass." this is also technique to make this lion real. As you see,everything is restored with care in this atelier. 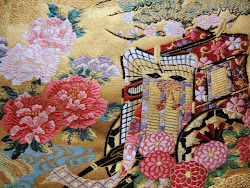 Embroidery of canonical robe in Japan has established for many years. These techniques should be succeeded to future generation. These pics below are postcards of Maiko. Maiko changes their "Kanzashi"(long ornamental hairpin) every season. In July,(this month),Maiko wears "Uchiwa" Kanzashi. "Uchiwa" means "a round paper fan". In August,they wears "Susuki" Kanzashi. And she's enjoying "a moon-viewing". As you see,people in Kyoto always care about a sense of the season. And Maiko express that by their Kanzashi. I admire their sensitiveness to the seasons,and their hospitality.